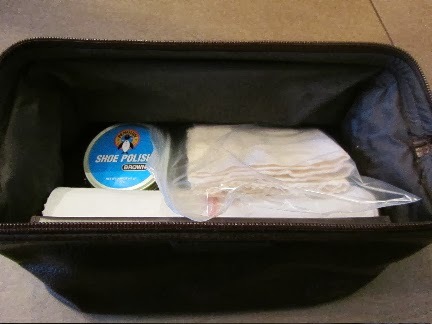 A shoe shine kit for my son, who works in an office and wears dress shoes every weekday. The only thing that I had to go out and buy was the tin of brown polish. The rest I had, here at home. 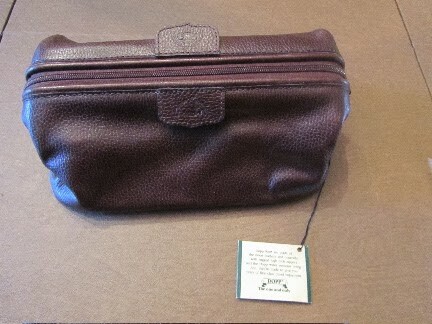 The case was an old-fashioned men's shave kit case, the kind older gents used before 911. I bought it as a gift for someone, who unexpectedly passed away just a short time later, never even taking the tags off of it. The mat is flannelized rubber sheeting. I had 2 large rectangles of this leftover from making crib mattress pads for my daughters, 18 years ago. I used pinking sheers to cut a piece large enough to place 2 dress shoes on for polishing, to reduce the risk of getting polish on the carpet. I rolled it up and secured with a large rubber band. The polishing cloths are squares that I cut from flannel scraps leftover from making myself some pj pants. Again, I used pinking shears for the edges. I made two cloths, and placed them into a sandwich bag, just to keep the kit all clean and tidy. The tin of shoe polish cost a whopping $1.86 including tax, at a local grocery super-store. When I walked in the door, I picked up the week's flyers. On the front page of the home and clothing flyer was a coupon for 15% off anything from the shoe department -- talk about good fortune! A manly man gift. Almost done with my son's gifts. Good way to reinvent what you have on hand. Does your son regularly polish his shoes? not as often as he should. His dress shoes have seen constant wear for about 1 1/2 years, and some polish really makes them look better. Currently, he borrows his dad's polish for his shoes. My son was hinting the other day that he could use some of his own. I was going to just buy a tin of polish for his stocking, then thought he might be more likely to use the stuff if he had everything he would need, all in one spot. 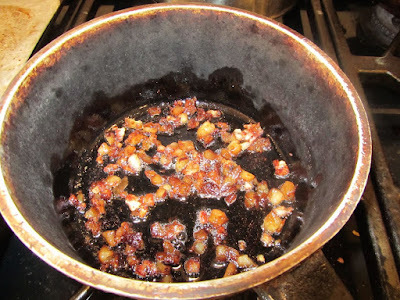 My dad used to polish his shoes every Sunday evening. I remember that so clearly from my childhood. It's one of those "habits" that seem to have fallen by the wayside. People just let their shoes get old, then they buy new ones. My dad used to take very good care of his shoes, polishing them, having them resoled, having stitching fixed, etc. And his shoes would last a decade, at least. Your cat is "helping"! We could never put ribbons on packages, as the kitty would eat the ribbons. I had forgotten how cats will pounce on the paper, as you're trying to fold it around the package. One way to look at it, its a sign that your cat is youthful and healthy. Have fun wrapping presents with your kitty! An awesomely practical gift to be sure! Does he only wear brown shoes? Are you considering adding a horsehair bristle polishing brush? I got one at WM recently, wasn't too expensive. I also grew up taking care of shoes, polishing them on Sundays. Yes, just the brown shoes. I was wondering about a brush and was going to ask my husband. I kind of remember my father brushing his shoes after the polish, but when I've done my husband's or son's shoes, I've just buffed with a cloth. Thanks for the info about Wal-Mart and horsehair brushes. I'll check there or the store where I went (still have the coupon for anything in the shoe dept). Carol and Delores, I bought a good shoe brush today to add to the kit. Thank you both for the suggestion! You might also want some cream polish. 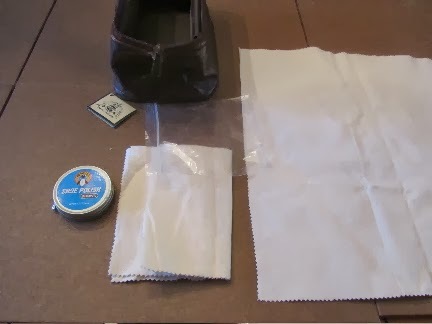 The wax polish will make your shoes more water resistant, while the cream polish will make the leather more supple. Have your son alternate between types of polish, for the best of both worlds. And I second the recommendation to get a good brush. You use the brush to remove excess polish. Good job, mama.This sounds like an excellent gift for your son. More young men should learn to properly care for their attire. Does he have a grooming brush, to remove lint? I was just about to Google shoe polishing brushes. Your comments just refreshed my memory. Now I distinctly remember my dad whisking a brush back and forth across his shoes, after the polish was applied. I don't recall the cream polish, but as I have a coupon, I'll see if the store I was in the other day has that as well. And now that you mention it, I have nice black dress boots that I wear every Sunday, and any nice occasion, October through March, and I have never given them a good polish. Looks like I'll be raiding my husband's black polish tin, to do my boots. Thank you! 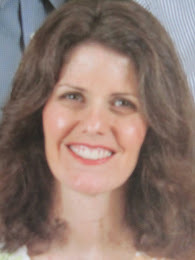 I so appreciate everyone's helpful comments and advice here. Great idea - men can be so hard to buy for! I think this is a good gift for the guy who may be just starting out in a career that involves a desk and dress shoes. My son has been borrowing his dad's polishing stuff for a while. Now he has his own. 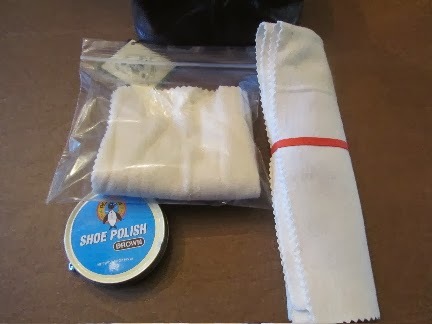 The shoe care section of the drug and discount store had a variety of small items that would make good gifts, from polish to shoe protecting sprays, special cloths, a couple of styles of polishing brushes, dress shoe laces, and more. A good place to look for inexpensive gifts for men.